Inductees to Salina Tech’s chapter of the National Technical Honor Society for 2017-18 are: Back row, Noah Pfannenstiel, Hunter Mendenhall, Joshua Gengler, Zaide Korb, Cheryl Gray. Front row, Laura Von Bergen, Erika Ruiz, Aubrey Bieker, Steven Weigand. Inductees to Salina Tech’s chapter of the National Technical Honor Society for 2016-17 are (Back row), Jeremy Unruh, Electrical Technology; Aaron Williams, Computer Aided Drafting. 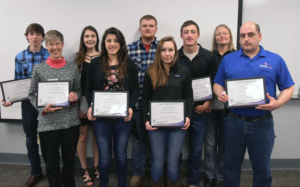 (Front row) Carolyn Aguirre, Dental Assisting; Amber Clark, Dental Assisting; Nick Karber, Diesel Technology; Trevor Karber, Diesel Technology; Blair Schmidt, Business Administrative Technology; and Sarah Van Arsdale, Graphic Design. 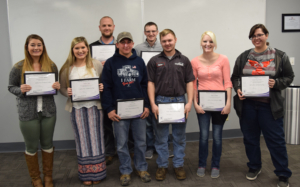 New inductees to the National Honor Society at Salina Tech in 2016 were (back row) Jimmy W. Derrick, II, Construction Technology; Cody Bacon, Electrical Technology; Herbert Parsons, Machine Tool Technology; Mark Toenskoetter, Machine Tool Technology; Vince Fromme, Business Administrative Technology; (front row) Telea Peterson, Dental Assisting; Khamphong Phomphansy, Electrical Technology; Shelby Hay, Business Administrative Technology; Monica Arias, Business Administrative Technology; Patsy Marie Titus, Dental Assisting; and Ashley Davis, Dental Assisting. 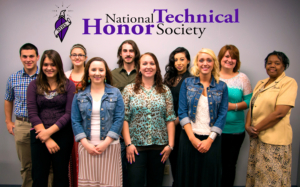 2015 inductees to Salina Tech’s chapter of the National Technical Honor Society are (back row) Jason Brantley, Computer Aided Drafting; Addiline Winship, Business Administrative Technology; Thomas Albright, Computer Aided Drafting; Lydya Arellano, Business Administrative Technology; Amanda McCosh, Graphic Design; (front row) Taylor Munoz, Business Administrative Technology; Alyssa Spector, Dental Assisting; Stephanie Jensen; Business Administrative Technology; Addison Hibbert, Dental Assisting; and Carolyn Hull; Business Administrative Technology.